Mintenko, Anthony. "Saskatoon Berry". The Canadian Encyclopedia, 01 May 2015, Historica Canada. 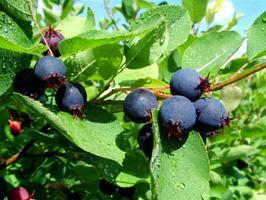 https://www.thecanadianencyclopedia.ca/en/article/saskatoon-berry. Accessed 25 April 2019. Saskatoon berry (Amelanchier alnifolia) is a deciduous native shrub that grows from western Ontario to British Columbia and the Yukon. Prairie Lane Saskatoons Orchard, Petersfield, Manitoba (courtesy Manitoba Agriculture, Food and Rural Initiatives). Ripe Saskatoon Berry Cluster (courtesy Manitoba Agriculture, Food and Rural Initiatives). Saskatoon berry (Amelanchier alnifolia) is a deciduous native shrub that grows from western Ontario to British Columbia and the Yukon. The city of Saskatoon takes its name from a Cree word for the sweet, fleshy fruits, which were of prime importance to Aboriginal people and early settlers. 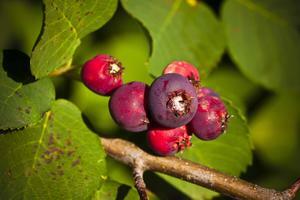 On the prairies, saskatoons were a major ingredient in pemmican. Saskatoons are very hardy plants that can survive winter temperatures of -50 to -60º Celsius with a lifespan of 30 to 50 years. Plant size ranges from a small to large shrub or tree 4 to 6 m high. Saskatoon plants are transplanted by hand or mechanical transplanters, typically 1 to 1.5 m apart in rows 4.5 to 6 m apart. Over time, these plants produce suckers (or daughter plants) that fill in the row and form a hedgerow. Plants begin producing fruit 3 to 4 years after transplanting. Flowering occurs from early May to early June (3-20 days long) and fruits are harvested from mid- to late July. Typically, grass cover is planted between the rows. In commercial orchards a plant can yield about 1.1 kg. Fruit are harvested by hand or mechanical harvester. 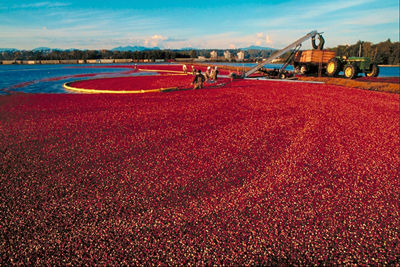 Commercial saskatoon orchards in Canada started in the late 1980s. Before that time most harvesting was from the wild. 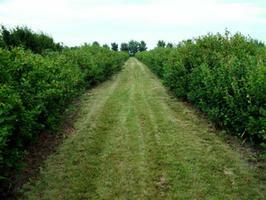 The majority of commercial orchards are present in Manitoba, Saskatchewan and Alberta. 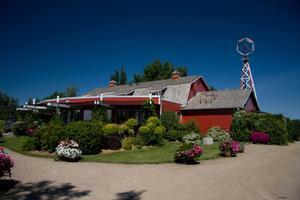 Most saskatoon orchards sell their fruit directly off the farm to customers, fresh or frozen. 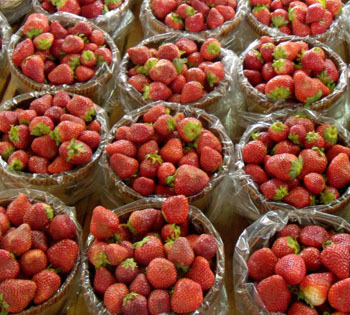 Some farms are u-pick operations while others offer pre-picked berries. Many orchards have begun selling their fruit for processing into jams, pie fillings, fruit toppings and syrups. Saskatoons have similar nutritional properties to other dark-coloured berries and, as with all fruits, are a good source of antioxidants. Richard G. St. Pierre, Growing Saskatoons: A Manual for Orchardists (1999); Manitoba Agriculture, Food and Rural Development, Fruit Production Guide (2007); Alberta Agriculture and Rural Development, Saskatoon Berry Production Manual (2013).